Torrent Powers up Water-type moves in a pinch. "When this Pokemon's HP is 1/3 its max or lower, its Water moves do 50% more damage." Diamond/Pearl Its wings deliver wicked blows that snap even the thickest of trees. It searches for prey in icy seas. 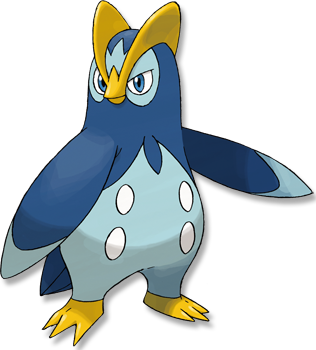 Platinum Because every PRINPLUP considers itself to be the most important, they can never form a group. Heart Gold It lives a solitary life. Its wings deliver wicked blows that can snap even the thickest of trees. Soul Silver It lives a solitary life. Its wings deliver wicked blows that can snap even the thickest of trees. Black Because every Prinplup considers itself to be the most important, they can never form a group. White Because every Prinplup considers itself to be the most important, they can never form a group.